The Androscoggin County Democratic Committee is a county-level political organization. The committee is centered around engaging county leaders in political positions at all levels of government. The committee was tasked with building an online platform developed to engage with their constituency. However, it was known that during the midst of the elections the site was going to see an uptick in users, and during the “off-season,” was going to decrease. As such, a robust and engaging platform for constituent was required. 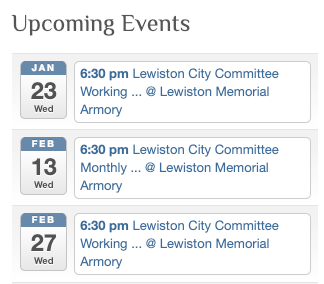 Using calendar tools, elected official lists, blog posts, and donation management tools, the Androscoggin County Democratic Committee website was designed with the constituent in mind. Providing the public, membership, and the leadership team with multiple ways to engage with each other, was center to the development of the committee’s website.